Well, it’s been two days since I did my last blog post about sliding backward. I have come to realise that I do indeed allow my intelligence to interfere with my ACTIONS. All the stuff I know about psychology and how the brain works has me analysing everything (and of course I’ve never been accused of that before – NOT! LOL). I need to let go of some of the inclination to overthink it and simply allow things to be there. Acceptance instead of searching around for “reasons why”. Acceptance instead of trying to figure out how to “fix things”. Given that I teach this stuff to my clients, you’d think I “should” be able to do it for myself, right? No such luck i’m afraid (go figure lol). I am beginning to think that my ability to teach others about this means that I put extra pressure on myself to “get it right”. That said, I also know that the more pressure I put on myself, the less likely I am to do exactly that. Amazing how that works, huh? So, in looking at how I let go of the need to analyse the stuff in my head, the last two days I have been playing the JFDI card. Taking action instead of thinking about it. Before my brain has a chance to kick into gear. While I haven’t been perfect at doing that, I have been determined to stick to the commitment I made in my last post. In these two days I feel like I have accomplished what I set out to do when I made my initial commitment, 5 weeks ago, to get back to basics. I have taken action on what I set out to do, and my head feels better for having done it. Of course, with all the extra water I’ve also been running to the loo every 5 minutes (well, 15-20 minutes maybe lol), but we can’t have everything we want all the time, right? These past couple of weeks have been a bit of a challenge. Two weeks ago I discovered an extra 2.5kg of fluid my body was hanging on to (a common occurrence). Since it has been a common thing, I thought to myself, no problem, it’ll come off by next week. As the week progressed, it went up a further 2+ kg, and then decided to release it and I ended up 400g lighter than the week before. I watched a Mish video today on getting back on track and decided that I really want and need to revisit some of the preseason tasks, particularly those associated with the reasons why I began this program in the first place and what I want to get out of it. What I want to achieve, the life I want to live. Stop thinking, stop talking, stop trying to figure yourself out – you will know yourself when you are ready to. Stop using your intelligence as an excuse for being stupid. The question is, how do I do that? By DOING I’ve been told. The mind will follow the body apparently. So, I am committing this week to play the JFDI card! Six training sessions and clean eating, with enough food preparation on my day off to feed me for the next week or two. It starts at 6am tomorrow with a PT session. This stuff is tiring, let me tell ya!! A few weeks ago I asked for some suggestions on activities I could do for the mini milestones at weeks 4, 8 and 12 for this round of the 12wbt. The aim is to challenge yourself, to get out of your comfort zone and do something that you would not ordinarily do. One of the other members I regularly train with at our local Saturday workouts suggested that I walk up a dirty great hill. Well, maybe not that great, but it is something that would challenge me! A search for directions on Google maps tells me that the walk is a smidge under 2km in distance from start to finish. I was going to post a link that would show a map of the route, but I can’t seem to figure out how to do that with google maps (wouldn’t surprise me if I was doing something wrong *sigh*). So, today is the very beginning of Week 4, and I was up at 5am to meet my fellow 12wbter (the one who suggested it) at 6:30! For her, this walk would be the very beginning of her training for the day and she would have done it a LOT faster than me! Google maps tells me that to walk it would take 18 minutes out of your life. For my friend, this would likely have been an accurate measure. When she made the suggestion that this could be my milestone event, she committed to coming along for the ride and support me through it. I truly value her support and appreciate her friendship and willingness to help me achieve this. Thanks Mel!! 6:30am found us at the bottom of that hill beginning the trek to the top. The sun was shining directly into our eyes on the way up. When you drive the route it looks deceptively easy. It is steeper than it looks, let me tell you!! While walking up that sucker you feel like your lungs are gonna pop out of your chest (maybe a slight exaggeration – just lol). We paused a couple of times for about 5-10 second bursts for me to catch my breath, and at the top so we could record the auspicious event with a photo, but other than that, I made it all the way up and then all the way down again, no stopping or sitting down. My legs were somewhat jelly-like by the time we reached the car again (that downhill part really tests those legs, let me tell ya!. We toyed with the idea of doing a second round, and then decided that I could use the time and beat it at the next mini milestone in Week 8. To do that, we really need a benchmark to beat, right? And of course I can’t get away without showing off the picture that was captured at the top. 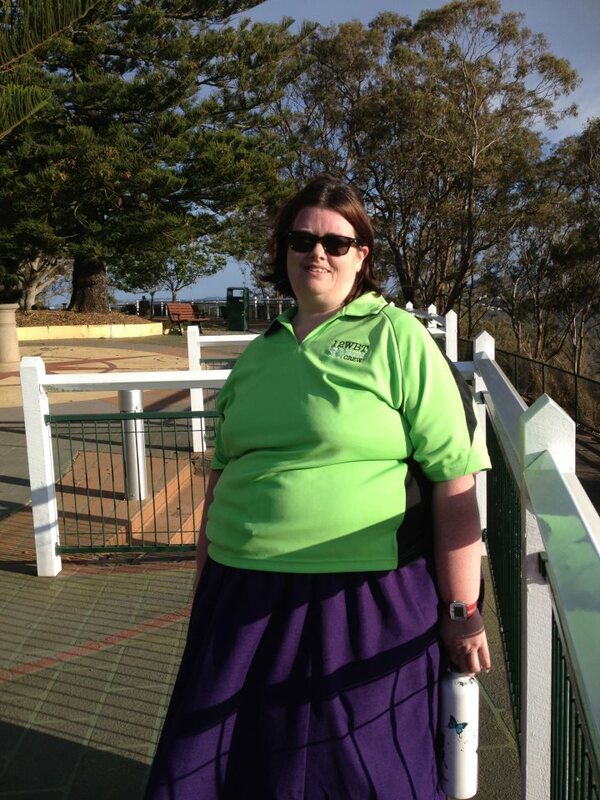 Note the incredible views you get when you stand at the top of the mountain that is Toowoomba! This is the blog belonging to a friend of mine. This friend is new to the 12WBT and while she is still feeling her way around the program, she is going very well! She writes very well and allows herself to process a lot of stuff through her writing. Hope you find it as interesting as I do. The week 2 weekly surprise was to create a board of all the things that inspired you to get fit and healthy. So why did I join the 12WBT and what keeps me going. I’ve chosen to do something a little different to the usual inspiration board. While I was at work the other day I had occasion to complete a mandala, which is a visual representation of what is happening for you in any given moment. Mandala’s come from the American Indian culture and are traditionally a circular shape, but these days they can be pretty much anything you want them to be. I started colouring in seemingly random colours, and as the pattern progressed I had all kinds of thoughts jump into my head about what the colours and shapes meant for me. 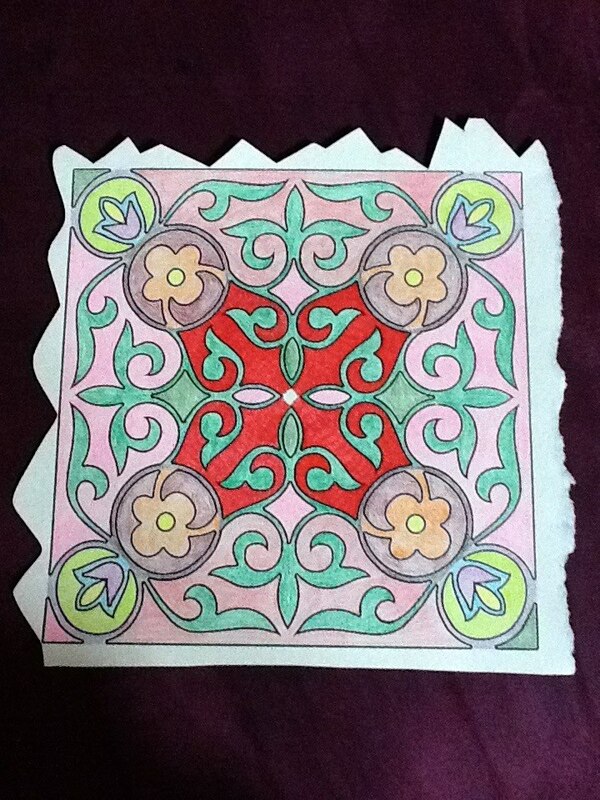 So, this is a photo of my mandala. A description of its meaning follows. The people who really know me will know what this is all about. The edges represent several possibilities of how our lives “travel”. Sometimes everything is running smoothly (straight edge at the bottom), other times it seems to follow a relatively even cycle of ups and downs (the smooth-ish waves on the left). Sometimes life seems so unpredictable and can be overwhelming (the jagged zigzags at the top). And then there are other times when it seems that things are going smoothly, but just underneath the surface the edges are deceptively rough and torn (the left side of the page), and the roughness can prove challenging. The shapes inside the circles in each corner represent some of the masks that we wear throughout our lives, or the crap that is thrown our way. Some of these could be happy masks (the tulip looking flowers in the more pastel colours), or they could be less happy, or even downright dark (the alien looking symbols immediately inside the tulips). These can wear us down and create a life of unhappiness and despondency. Immediately surrounding the alien looking symbols is a narrow black circle, which represents the dark days in our lives. Those hollow days where nothing ever seems to go right. No matter which type, these help define who we think we are. The green leaves are pathways that connect everything that we do, think, hear, see and feel. They help us to connect the events in our lives, the people we encounter, the family we have, and how we react. No matter what happens to us in life, no matter what we are given, no matter the masks we wear, and no matter the connections and interpretations we make, our inner core is always there. This woman is always watching, always waiting for us to truly understand our purpose. She can always be relied upon to let us know when things aren’t going the way they are meant to. She can always be depended upon to keep us upright and supported. She will always look after us and ensure that we come out of any challenges stronger. She is permanent, never wavers and is a fiery core to be reckoned with if we are threatened (even if it is our masks that create the threat). This is why she is red. She is fire. She is our red woman. She is our authentic self. And she will ALWAYS take care of us, no matter what else is happening for us. You will notice (if you look closely) that the pen strokes are all pointing inward to the centre, which is the direction we are meant to look going forward. At the very centre is a small blank space, which represents somewhat of a blank canvas in our life. This is the opportunities that we have, the endless possibilities and the chance for our red woman to create the life we truly deserve. It is closely placed with the connections in our lives to ensure that we are able to make some sense out of them, and while the lines are a little uneven (hard to see in the picture), our red woman will always support us in knowing what is right for us. This picture is essentially about my ability to trust in my authentic self. To allow the real me to come forward and stand up for the life I truly deserve. The 12WBT for me is about creating the life I deserve. My entire life to date has (seemingly) concentrated on the masks. Those things that have fed my weight issues and the insecurities that have caused them. I have discovered in the last 2 rounds that I need to trust in myself more. That I am capable of and deserve so much more than I currently have. This mandala is telling me that my red woman always knows what is right for me. All I need to do is TRUST and LISTEN to her, and the weight will take care of itself. In fact, every area of my life will take care of itself. There is no real purpose for this post. I just wanted to put it out there that the weigh in last Wednesday revealed that I am 1.5kg away from two major milestones. To have donated a total of 30kg since day 1 of preseason Round 1 2012, and to be under the next 10kg increment. Weigh in is tomorrow morning. Just a tad excited, cause my nutrition has been spot on and I know I’m going to go wayyyy under!! Thought I would drop in to give a sum up of the first week of this, the third round of the 12WBT. I did pretty well, I think. Not completely perfect, but well, regardless. Training wasn’t so great. Only two sessions this week, one of which was an awesome PT session. I need to figure out what the block is. Or, I just need to JFDI and stop my brain from thinking before I get started. Nutrition was much better. I had one slip up last weekend just after I went shopping for groceries. Bought a block of chocolate and a few mini wagon wheels and at them. The rest of the week has been great. Monday night I cooked some meat pies and on Wednesday I made some pumpkin & garlic soup and fish stew. These, along with some healthy cereal and the makings for meat and salad sandwiches, got me through the week quite nicely. The last 24 hours or so I’ve been a little fidgety, wanting to “make a break” and get some junk food, but i’ve successfully avoided it. Tomorrow I plan to make some meatballs, chicken parmagana and a tuna, cherry tomato & zucchini bake, along with some banana bread to get me through the next week. Overall I’m reasonably happy with how I’ve done. As I say not perfect, but much better than I would have been in the past. Tomorrow I will do another SSS training session and cook the meals mentioned above.